Stevie Starlight is a young legend in the Venice Community. It is with great pleasure to offer this tour of Venice Beach, which is the number one tourist attraction in the world. You will meet the most artistic and creative souls on the planet who live and work in Venice as well as visit the monumental tourist attractions in which we live. Places such as the world famous Venice Canals, where Jim Morrison "wrote Love Street". The Beach, This is the thing that makes Venice the most special place on earth. The World famous Venice Beach Boardwalk. Best View in Venice at the HIGH Rooftop Lounge Perched atop the Hotel Erwin overlooking the Pacific Ocean, High is the premiere Venice Beach open-air lounge, where the nightly sunset is the main event. The Townhouse, the oldest bar in Venice and Danny's across the street. Abbot Kinney Blvd, The beach away from the beach. The end of Washington Street and the Venice Pier, with it's variety of restaurants, bars, and entertainment which is also the beginning of the Venice Boardwalk. Then to the end of the Boardwalk, which is essentially Rose Avenue. 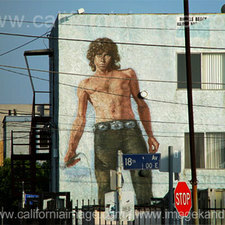 The Sidewalk Cafe, The Gargoyle House, The Jim Morrison Building, Muscle Beach, The Venice Skate park. The artists, musicians, and the local legends, like Harry Parry, Tree Man, Block and Bobby Bliss' Venice Originals Skateboard Shop, and much much more. We can customize a tour to fit your need to make it easy, enjoyable, and most importantly to allow you to get the greatest experience possible. "So don't hesitate to Come Over when we're alive" ~ Stevie Starlight ~ Come Over. The best three hours you could possible spend in Venice at some amazing places, with some amazing friends, and, family. A 15 minute Jam Session with Stevie or just a chance to hear him play your requests.